Honey Nut Cheerios – the cereal brand with the famous bee mascot – is aiming to help bring back the bees. Around the globe, bee populations have been declining at an increasingly rapid rate, which poses a threat to crops dependent on bee pollination. 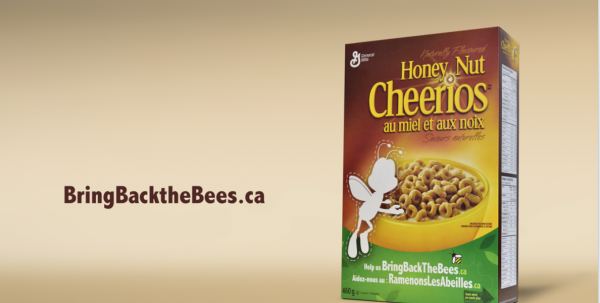 To raise awareness about the issue and help bee populations, Honey Nut Cheerios has launched “Bring Back the Bees,” an integrated campaign created by Cossette. The campaign asks consumers to help Canada’s bees by planting wildflowers in their communities. Consumers can visit BringBackTheBees.ca to request free Veseys wildflower seed packs in the mail. The brand also had an onsite activation at Canada Blooms in Toronto on March 11 where brand ambassadors handed out 50,000 seed packs to visitors. As part of the campaign, Honey Nut Cheerios is removing “Buzz,” the brand’s mascot, from the front of the cereal box for a six-week period. “It’s a bold move for us because that bee is a beloved character that draws people to the brand, but we thought it’s worth it to really make a bold statement to get that awareness going,” said Eriksson. A TV spot and online video uses a compilation of viral videos that show people helping animals in distress, such a baby elephant trapped in a well and ducklings that fell through a sewer grate. Then a super reads, “Helping is in our nature. Now another friend needs our help,” and the spot to cuts to real-world headlines on the global dangers of honeybee loss. The spot features a cover of the Mr. Mister song, Broken Wings, performed by members of Toronto’s Choir! Choir! Choir! The campaign, which runs until July, also includes social media, out-of-home advertising and public relations. On the PR front, the brand enlisted bee expert Marla Spivak, professor of entomology at the University of Minnesota, to support the initiative. The campaign runs until July. Media planning and buying is being managed by Cossette Media. Tribal Worldwide Tribal Worldwide is promoting the campaign through General Mills’ Life Made Delicious website and its social platforms, Veritas is handling public relations, and Hunter Straker developed the packaging.